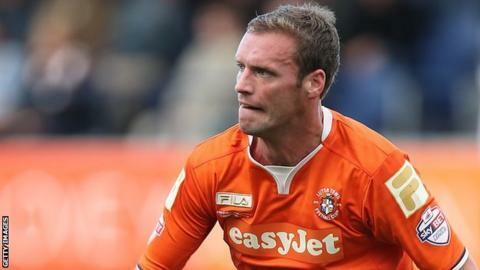 Andy Drury's first-half goal was enough to earn Luton victory at Plymouth. The hosts failed to clear from a corner and the ball fell to Drury in the area, who fired into the corner of the net. Plymouth debutant Olly Lee, on loan from Birmingham, almost levelled but his 25-yard free-kick was turned around the post by Town's Mark Tyler. Curtis Nelson was also denied by Tyler, before Reuben Reid shot wide as the hosts searched for an equaliser, but the Hatters held on for the points. The win was Luton's first away from home since 18 October and saw them rise to fourth in League Two. "It was a very very good performance against a very good team. "I think even the strongest Plymouth supporters would probably agree we deserved to win today. "I thought we passed well, we moved well, we carried a threat, Tyler hasn't had to make many saves of note. It's been a good day for us. "We didn't get beat at Wycombe, we played a good Shrewsbury side and didn't get beat. Our form is good. They're tough games, but we're up for the tough games." Attempt missed. Carl McHugh (Plymouth Argyle) header from the right side of the six yard box is too high. Corner, Plymouth Argyle. Conceded by Scott Griffiths. Corner, Luton Town. Conceded by Tyler Harvey. Tyler Harvey (Plymouth Argyle) wins a free kick in the attacking half. Jonathan Smith (Luton Town) is shown the yellow card. Foul by Tyler Harvey (Plymouth Argyle). Corner, Plymouth Argyle. Conceded by Steve McNulty. Corner, Plymouth Argyle. Conceded by Luke Wilkinson. Attempt missed. Tom Flanagan (Plymouth Argyle) header from the left side of the six yard box is close, but misses to the left. Corner, Plymouth Argyle. Conceded by Michael Harriman. Attempt saved. Jake Howells (Luton Town) left footed shot from outside the box is saved in the bottom left corner. Reuben Reid (Plymouth Argyle) wins a free kick in the defensive half. Attempt missed. Jayden Stockley (Luton Town) header from the centre of the box is close, but misses to the right. Olly Lee (Plymouth Argyle) is shown the yellow card. Foul by Olly Lee (Plymouth Argyle). Hand ball by Jake Howells (Luton Town). Nathan Doyle (Luton Town) is shown the yellow card. Lewis Alessandra (Plymouth Argyle) wins a free kick on the left wing. Attempt saved. Nathan Thomas (Plymouth Argyle) left footed shot from outside the box is saved in the centre of the goal. Substitution, Plymouth Argyle. Nathan Thomas replaces Dominic Blizzard. Attempt missed. Tyler Harvey (Plymouth Argyle) left footed shot from the right side of the box is just a bit too high. Second Half begins Plymouth Argyle 0, Luton Town 1. Substitution, Plymouth Argyle. Tyler Harvey replaces Lee Cox. First Half ends, Plymouth Argyle 0, Luton Town 1. Attempt missed. Olly Lee (Plymouth Argyle) right footed shot from a difficult angle on the left is close, but misses to the right.